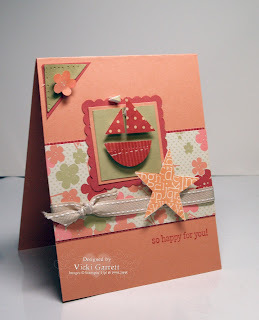 This little card was created for a Colour Challenge for Kristi's Birthday Bash!!!! Apparently it was a great party on the Hanna Stamps Member Forum............In fact I missed most of the party, but still caught up with the late nighters at the end of the evening!!!! This Riley will be released Friday, along with the Domestic Goddess Stamp Set. 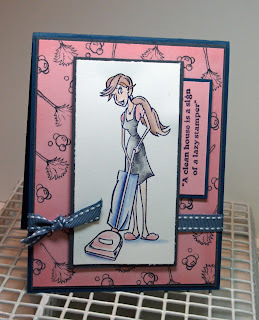 The newest set to be released this Friday at Hanna Stamps, Domestic Goddess is the sweetest stamp set.............armed with vacuum, broom and all sorts of neat cleaning products, this new addition will surely charm you!!!! Check out my Fellow DT sites, to see the scrumptious samples they have created. Stay tune for more exciting sneak peeks of Hanna and Riley this week! The Party is on! 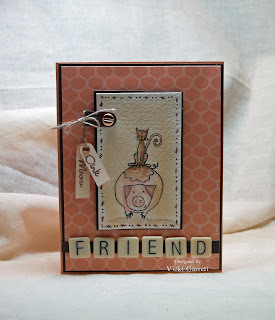 Join Kristi and Friends over at the Hanna Stamps Forum on Splitcoast Stampers. It's Kristi's Birthday Today and she wants to celebrate with you. There will be lots of Prizes, Challenges and other fun stuff waiting there for you!!!! I won't be able to make it, but I hope you all have a great time!!!!! Riley has a little buddy, well actually a cute little chick to help him gather Easter Eggs!!! This cute little image will be available at Hanna Stamps on February 1st. Paper: Celery, Brocade Blue DCWV Glitter Stack Paper. Accessories: White Gel Pen, Gingham ribbon, Dimensionals, Watercolour Pencils, Blender Pens all from SU! After a long night of partying with his Buds, Riley needs to take a chance just to chill out, drink his cocoa and eat his freshly baked cupcake!!!! Isn't this image the SWEETEST???? I can hardly wait to share all the great Riley images with you. I like this card, because it has a masculine feel to it. The DP is from Daisy D's and was some left over scraps from a Scrapbook layout. Images were coloured with SU! Watercolor pencils and blender pens. Buttons, wide grosgrain and a little hardware complete the look. Hope you come back tomorrow for another peek to see what our Riley is up to next!!!! Don't miss the Release Party in the Hanna Stamps Forum this Friday night!!!! Big News!!!! Hanna's Riley is in DA HOUSE!!!! I am SO excited!!! 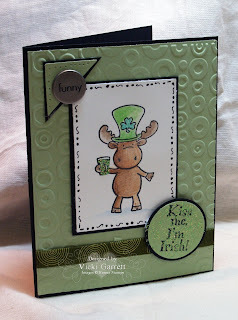 This Friday, Kristi over at Hanna Stamps is releasing RILEY MOOSE stamps! These are the cutest little creatures that I have set eyes on and guess what?? 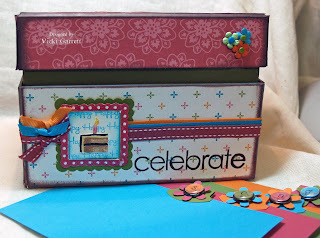 Kristi is having a HUGE party to celebrate the release of Riley, as well as HANNA's membership on Splitcoast Stampers!! Watch my BLOG all of this week for new Riley Samples!!! This card contains two images of Riley getting ready to celebrate St. Patricks Day. A little masking and I was able to create this party card quite easily. 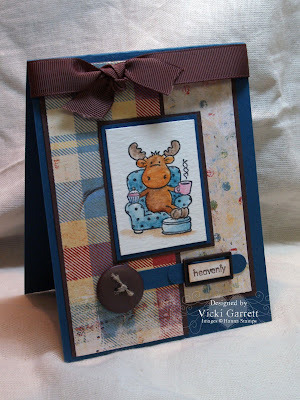 The DP is from Crate Paper, the sentiment was created by using Karen Foster Snap Stamps. Congratulations to Kristi on the Release of her furry friends and embarking on an adventure by creating the member forum on SCS!!!! Have a great day and don't forget to get your fingers inky!!!! I have decided in my commitment to work toward fitting into my summer close, I will create packaging for each and every piece of candy that comes through the door !! THAT way I will surely not eat any chocolate before it's time. Since I am at risk for being late to work, I'll get right down to the nitty gritty! 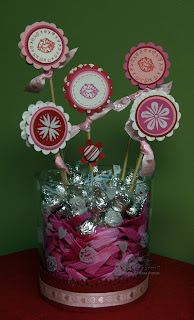 I made this little chocolate ensemble using the Celebrations set from Hanna stamps. I stamped the acetate with white Stayzon, letting it dry before scoring it. 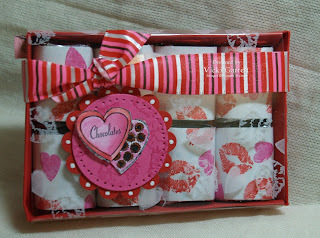 The lips and hearts were then stamped on labels and wrapped around those yummy Hershey Nuggets! mmmmmmm, have I ever mentioned that I LOVE chocolate (lol!) The circular tag was made by colouring and cutting out the image, layering it onto a 11/2" circle before paper piercing and mounting that circle onto the SU! Scallop Punch Die. The Heart on the Teddy Bear Card is a punch that I have, layered on to whisper white cardstock and trimmed with decorative scissors (phew, glad I didn't throw those out!!). Anyway ............gotta run.........I don't want to be writing a post about being out of work...........how in the heck would I pay for my stamps????? When I first saw the Nursery Necessities set, I really wasn't sure that it was my cup of tea. I ordered it on a whim (and because it was discounted!) and am I ever glad that I did. All images are from Stampin' Up! 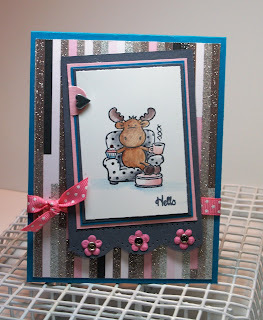 This card was created for a Featured Stampers Challenge on SCS. I wanted to see if I could create a card as well, that wasn't the traditional baby colours. I used Groovy Guava as my Card base, along with the new Ginger Blossom DP. River Rock and Ruby Red are the accent colours. I paper pieced the boat for a little interest and mounted that and the star on dimensionals to create a 3D effect! Stay tuned over the next couple of days, I have some great scoop hot off the press for Hanna.........but if you just can't wait, check out my fellow Hanna Design Team Members blog for some sneak peeks. We also welcome three great additions to our Team. Cindy Haffner, a fellow Canadian Stamper whose work always rocks the house! Shelly Kuck who never ceases to amaze me with her delectable creations and Leann Yoho and awesome stamper from South of the Border! 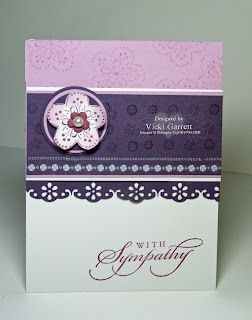 The challenge was to complete a card using this layout that was found on page 37 of the new Stamping Up! Catalogue. What is very interesting is to see the variety of designs that my challenge buddies have come up with. Follow the Sidebar on my Blog to see their cool creations!!! Accessories: SU! Rub ons, Circle Punches. Martha Steward border punch, SU! Pretties Kit Pearl. Sorry, I didn't make it in yesterday.................I was nursing a Hangover!!!! Yep! a real cyber induced doozie!!!! You see, the night before, I attended the My Favorite Things Cocktail Release Party on Splitcoast Stampers!!! It was such fun, but the posts are fast and furious, there were so many great samples to see from the design team and you have to read really fast to keep up!!! That being said, the excitement is contagious as everyone anticipates the release of the new Stamp Sets. This month, Kim released two full sets and a mini set, for which I have posted samples of each here. 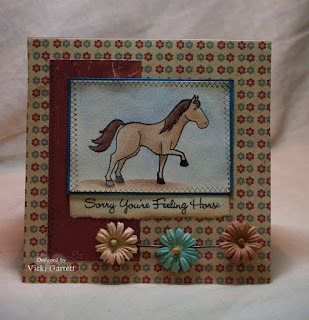 This sweet Horse image is from the Punny Farm Set. 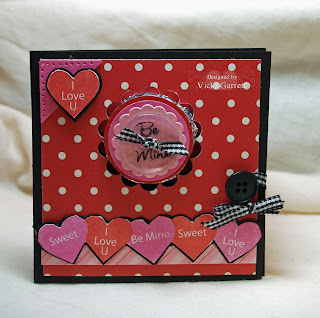 The card base is made with We R Memory Keeper Kitchen Cards. DP is from Cosmo Cricket. Prima Flowers mounted on a Seven Gypsies metal embellishment complete the look. Want to make a Sweet for your Sweet??? I made this little candy card with a Peppermint Patty Centre. Stay tuned for a mini tutorial coming soon. The sweet heart border, heart embellishment and sentiment are part of the Be Mine set. Finally, My Birthday Celebrations Box and the Mother's Day Card were both made with images from the Happy Occasions Set. This set is great for making quick cards or creations that follow the clean design trend. I covered this $$$ store Recipe Box with SU's! Designer Paper and then Stamped, Layered and mounted the Birthday Cake image onto the stamped background. 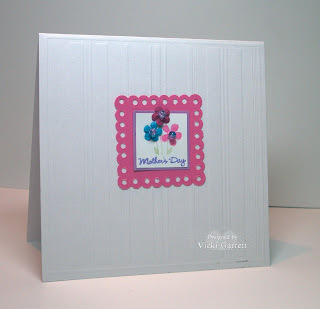 I love the little polka dotted frame in this set because you can stamp the frame to coordinate with any colour!!! I cute File Cards at 4x6 inches and embellished the tops with contrasting Tab and Flower Punch Outs with Build a Brad centres. 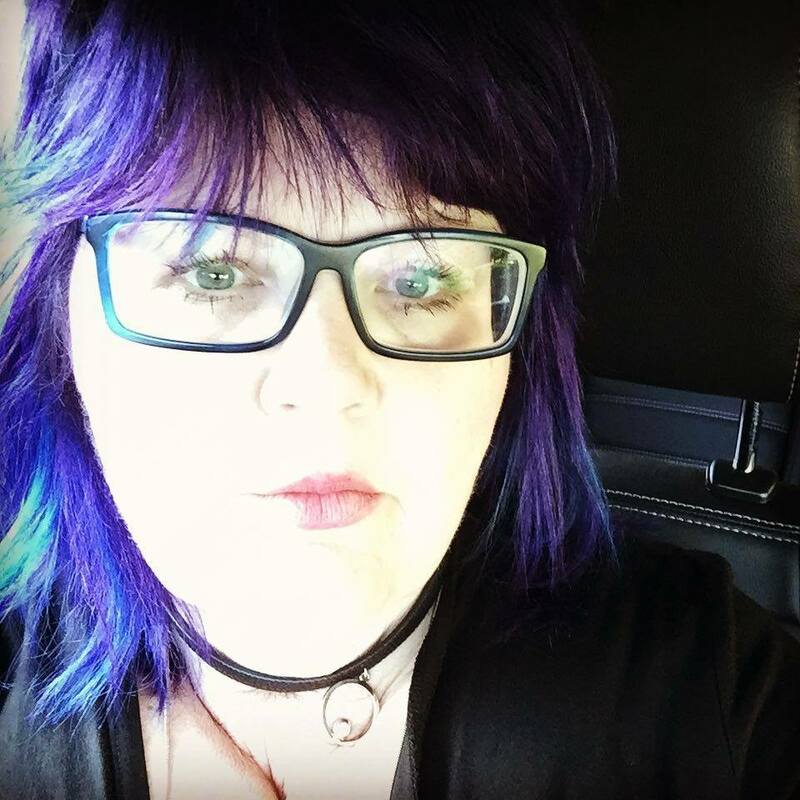 Follow the MFT Icon on my Sidebar to check out all the stamps and other goodies that Kim has to offer over at My Favorite Things. For my Canadian viewing audience (he he!!!) Kim is very very prompt with shipping your purchases and your schtuff will be here before you know it!!!!!!! Once again, a Humongous Thanks to Kim for the Gorgeous Stamps and the Opportunity to experience the excitement of stamp releases over at My Favorite Things!!!!! Pigs don't fly, they love cats! Well, this little piggy does anyway!!! Down on the Punny Farm at My Favourite Things all the little critters get along!!!!! You will be amazed at this menagerie of farm animals with matching sentiments in the Punny Farm Set. Kim will be releasing these sets tonight!!! 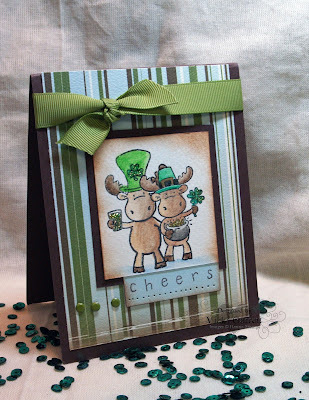 Hop on over to Splitcoaststampers at 8:30 est for the release party. It's a lot of fun and you can take the challenge to be February's Guest Designer! You will find the party HERE! 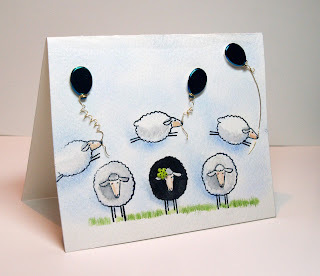 The main images in this card were watercoloured with an aquapainter and watercolour wonder crayons. One reason why I am partial to the crayons is that I find it really easy to remove colour for highlighting. Once the image was completely dry, I used a sponge and stamping pastels to shade in the background. I love the sentiments in this set because they conveniently fit into SU! 's word window punch. For the little sentiments, I stamped, then punched and trimmed them to size. I set an eyelet into each before tying them onto the anchor, which was also created with the same punch! 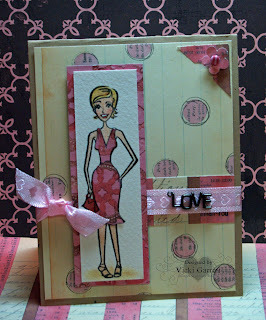 Recipe: DP and Cardstock from SU! See you at the Party! I can't wait!!!! Pigs don't fly, but sheep do!!! Well, they do in my imagination. These cute little sheep are a part of the Punny Farm set. One of the latest sets from My Favorite Things to be released this Wednesday. 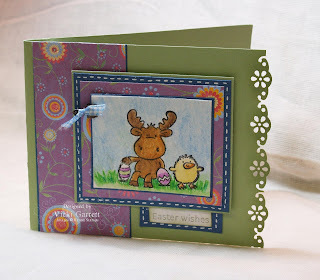 This is a simple one layer card that I stamped and coloured with Watercolour Crayons and Aquapainters. I chalked in the Sky and Shadows around the Sheep and Lambs with Stampin' Pastels. I poked tiny holes around the lambs muzzles to thread wire for the Balloons through and attached the wire to these Teal coloured Balloon Brads. A single Flower in the hair of the Black Birthday Sheep sets this dolly apart from the rest!!!! On the inside of the card, I have stamped the sentiment "Herd it's your Birthday"! Follow the Sidebar to MFT to get the scoop on these up and coming sets and stay tuned to see what's on the grill tomorrow!!!! Have you been wondering where I've been since last Thursday? Well, just like one of Santa's little elves, I have been in my workshop cooking up some ideas with the new My Favorite Things Stamps that will be released this Wednesday. I was So lucky to be chosen as the Guest Designer for January. I was thrilled to recieve an awesome package of stamps from Kim over at MFT and I couldn't wait to play!!! I believe that today is the day we can share some of our creations, but just to be sure, I have only given you the slightest of peeks!! 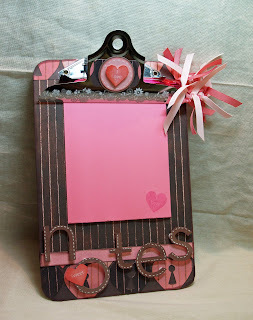 See the little hearts that I have used as embellishments on the mini clip board and the Post-it pad? 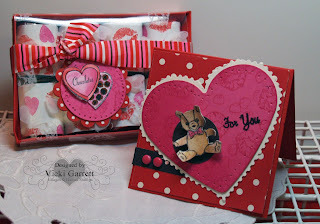 They are absolutely adorable and hail from a sweet Valentines Day set called Be Mine! Please stay tuned for more sneak peeks and don't miss the release party on Wednesday over on Splitcoaststampers! I'll post more details about that later today or tomorrow!!!!! Tonight at Midnight est, you will be able to purchase the latest Hanna Stamp Set-Hanna's Celebration Set. Although I have been stuck in Valentine Mode, if you follow the links on the sidebar to the blogs of my wonderful fellow designers, you will see that clearly this set is not only for Valentines Day. As soon as I saw the luscious lip stamps in the set, I new that I wanted to create a bouquet of kisses. The flowers were made using the SU! Scallop Punch to cover peppermint patties. The circle layers start at 1.5 inches and work down to 1.25 inches and are embellished with Hanna's Celebration Lip Print in Pink Passion and Red. Using BBQ skewers, I mounted the "flowers" onto the skewers and into some craft foam that I adhered to the bottom of the vase. The two white flowery centres are SU! new Rubons!!!! I stamped the Dollar Vase with the lip and heart prints in white stayzon ink and punched a Red Band of Cardstock along the Bottom and added a layer of pretty in pink spool ribbon. I have had this funky fibre yarn kicking about for a bit and used it for filler in the vase along with some kisses to sweeten the pot!!! This is the Drive-Thru version of posts!!! Tonight, I will just get right to it..............you won't be subject to my incessant rambling. The Main image hails from the HANNA Stamps Celebration set. Isn't she pretty in the Rusty Pickle Paper Pieced Dress? I honestly can't recall the designer of the background papers because I slice off the tab and failed to take note!! Spool Ribbon, Queen & Co. striped brad and a Dollar Store Metal embellishment complete the look of this "Springy" Valentine. Hanna Celebration is being release this Friday......follow the Hanna Icon on my sidebar to see what Kristi has cookin' up over at Hanna Stamps!!! Hope you all survived last nights festivities!!! Me? No problem! A quiet night at home after a trip to Blockbuster. Caught the fireworks on the way home. After watching the Ball drop in Times Square, I intended to head off to bed, but NO.........NO........Hanna's Valentine was beckoning me.......just one quick little project before bed. After all, I could sleep in today!!!! The upside to this is that I am gong to be well ahead of the game before Valentines Day......in fact, I may have to start wandering the streets of Kingston accumulating more "Sweethearts" to lavish with my Hand Stamped Goodies. For this project, I used an inexpensive jar from the Dollarama. The Main image is the Triple Heart Accessory from Hanna's Valentine Set. I Paper Pieced it and layered it over SU! Oval and Key Tag Punch outs!. I must say that I am as addicted to SU! 's new Rub Ons. They are Beautiful and are as easy to apply as butter to toast!!!! 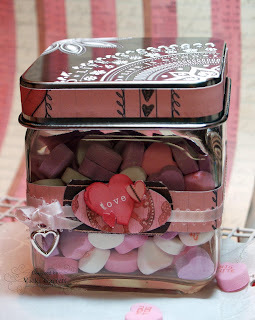 A smidge of Rusty Pickle DP, some Thin Satin Ribbon and a $$ store charm complete this quick and easy project...........filled with Love Hearts because Chocolate wouldn't stand a chance of making it until Valentines Day!!!! !